Hello and happy April from the dogs and the volunteers! 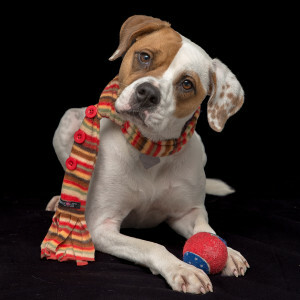 The shelter is hopping this month with Open House this coming Saturday the 20th from 1-3pm. 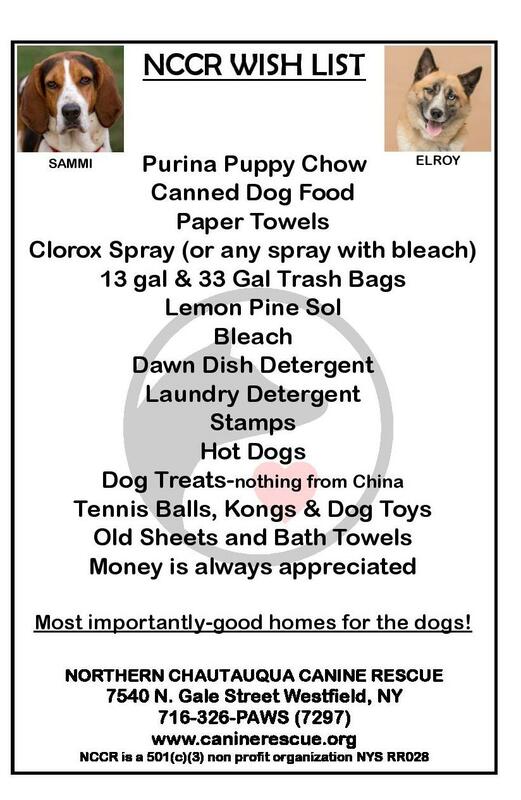 Stop by to drop off donations, meet the volunteers and learn how you too can help, or most importantly meet the dogs who are hoping to find homes. Wonderful Dogs: Please take a look at this collage. These are all super dogs with the volunteers who they know and trust, but they often don’t display well in their kennels to new people who come to see them. 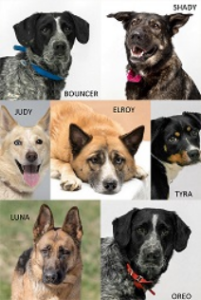 These happy go lucky dogs probably show best if potential adopters would have a volunteer go with them and the dog out in the yards or the learning center. Just ask us; we would be happy to show off a dog for you. We think these dogs are great; we want you to see that too! Who doesn’t love pancakes???? 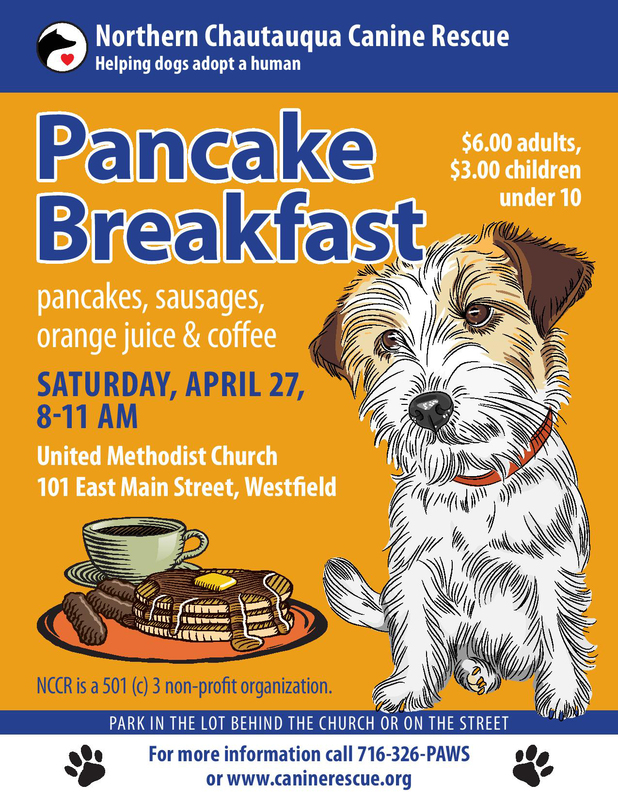 Call your friends up and come to our annual pancake breakfast April 27; by feeding yourself, you will help feed the dogs as well! 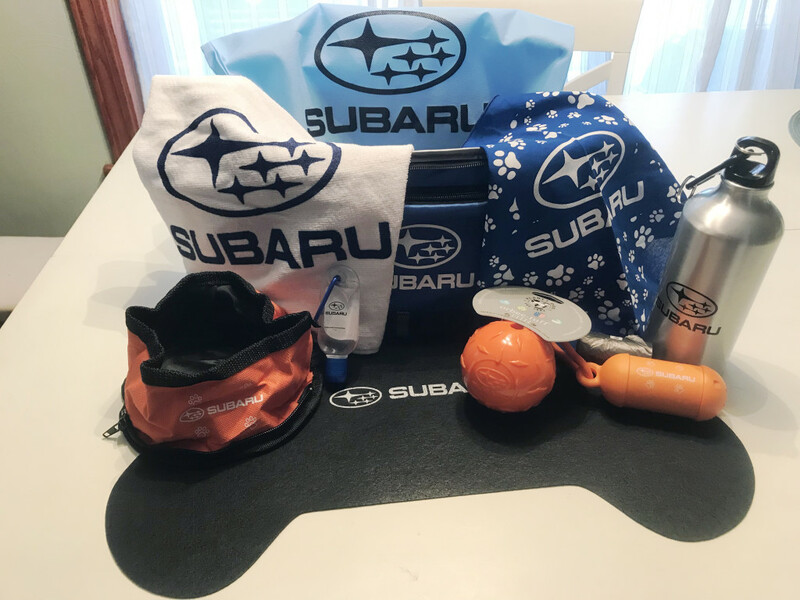 Plus NCCR will be raffling off three great prizes and Subaru will have a free drawing for a dog themed basket as well. Check out the images for all the details. Stop by, try your luck with some raffle tickets and put your name in for the Subaru prize! NCCR will also have volunteers at the Greystone Nature Preserve Expo at the Fredonia State University Science Center Saturday April 27th from 9-4 helping to celebrate Earth Month. 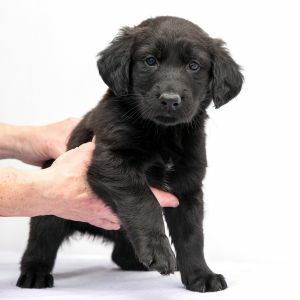 The shelter has a lot of dogs right now as well as two litters of puppies that will be available in May. Keep an eye on the website if you think you have the time, love, patience, and ability to help a puppy become the best possible adult it can be! We thank you for all your support and would love to receive any updates if you have adopted from us in the past! NCCR is located at 7540 N. Gale St. in Westfield, NY and is open Monday-Saturday from 1-3pm or by appointment by calling 716-326-7297. All the shelter dogs past and present, big and small, young and old would like to thank everyone for their donations over the past year. 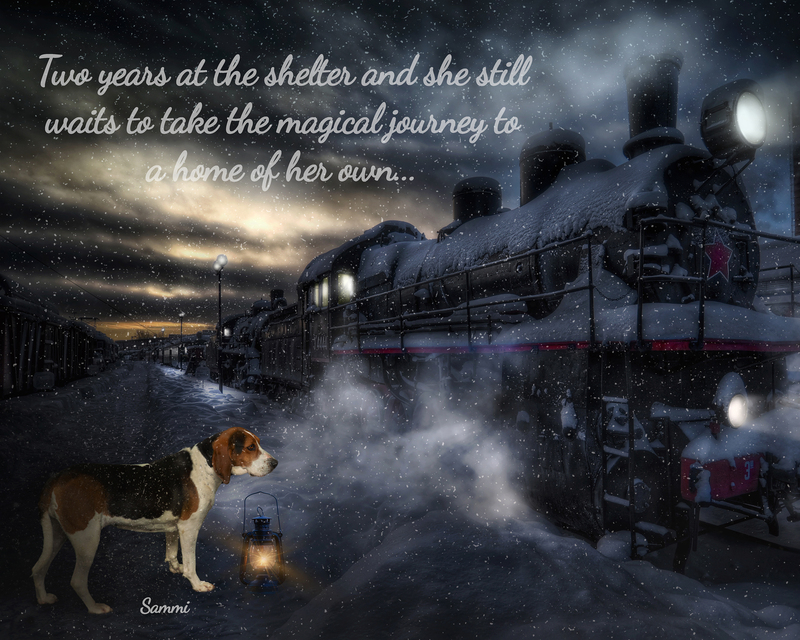 There will always be dogs and puppies waiting for good homes, and your donations help feed them, keep them warm and pay for all their veterinary bills.NCCR is a New York State Registered Rescue, RR028, and is a 501(c)3 non-profit organization. For more information about the clinics and rabies in general, click here or contact the Division of Public Health at (716) 753-4481. We hope that you will join us for the upcoming events. See the detailed list by clicking on the “read more” tab. 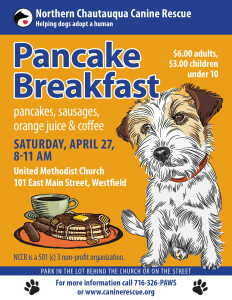 ANNUAL PANCAKE BREAKFAST: Saturday, April 27th from 8-11 am at the Methodist Church in Westfield. GREYSTONE NATURE PRESERVE EXPO at the Fredonia State University Science Center Saturday April 27th from 9-4 helping to celebrate Earth Month. NCCR will also have volunteers there! 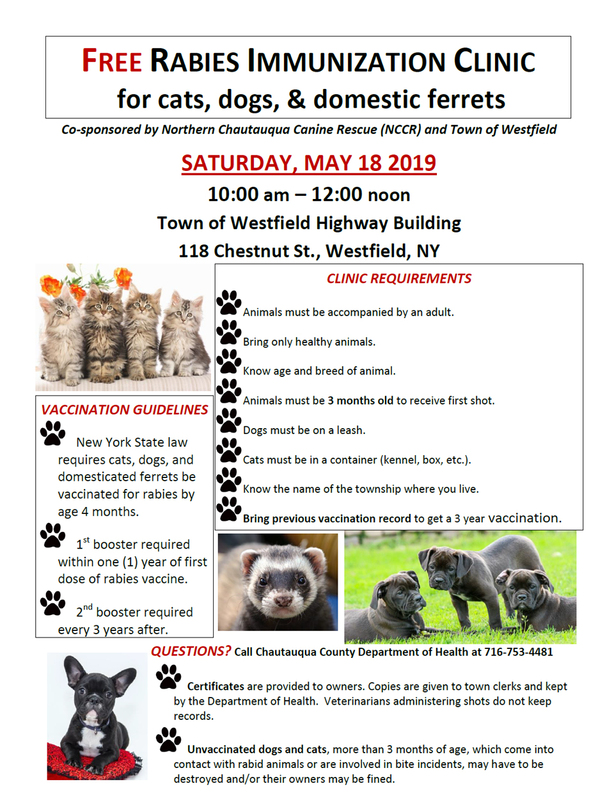 FREE RABIES CLINIC: Saturday, May 18, from 10 a.m. to noon at the Town of Westfield Highway Building, 118 Chestnut St. in Westfield. This clinic is sponsored by the Town of Westfield and Northern Chautauqua Canine Rescue. Dr. Katie Ball will be the attending veterinarian. Would you like to volunteer at NCCR? Please complete the volunteer application found by following this link and forward it on to us: http://www.caninerescue.org/volunteer/ and we will let you know when the next volunteer training session is. hile on that page, read about some of the volunteers and why they give their time to the dogs! Please share the training information with any interested friends, family, or co-workers; new volunteers are always welcome! 3 5 8 Productions has produced a short film with the help of filmmaker Ashley Baron on NCCR, focusing on the help we provide for dogs in need, some of the challenges we face and how the Sampson Fund enables us to care for the ill and injured dogs that arrive at NCCR each year. We hope you will take a few moments to watch the film here: http://Bit.ly/NCCRMovie. In addition to the film, Logan Alexander of 3 5 8 Productions, recently delivered their very generous donation of over $1500 from their sale of limited edition hoodies. Thank you to all who took part in making the film and to those who sold and purchased the hoodies. 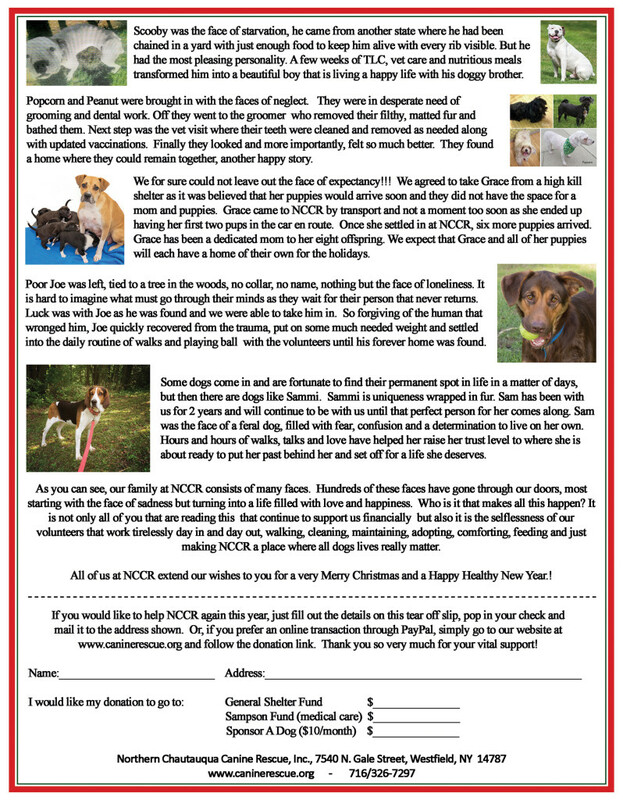 We could not help as many dogs as we do year after year without the support of so many community members!